In the spirit of full transparency, we just want to say - there are LOTS of subscription boxes out there for brides to dabble with. And if you’re the kind of bride who wants to collect ‘em all, then by all means, doooo itttt, you’re part of the e-club, and it doesn’t last forever, so go ahead and be as extra as you want. You have our blessing!! That said, weddings aren’t cheap, brides, so if you have to start getting choosy with your nuptial must-haves, make sure that the Miss to Mrs Box makes the cut. They’re one of the OG bridal boxes, and if you haven’t heard of them ((you sweet, newbie bride, you)), we’ll help you get acquainted. I remember when my sister got engaged last summer, it only took her about two months before she had me over to ask ALL the advice on picking a bridal subscription box. You’d swear we were talking about something super critical, but no, she just wanted to know which box she should bet on to take her from newly-minted fiancé to just-married missus. And, ultimately, she decided on the Miss to Mrs Box. Made perfect sense, right? 💍 The box is essentially your companion for the entirety of your wedding planning journey. 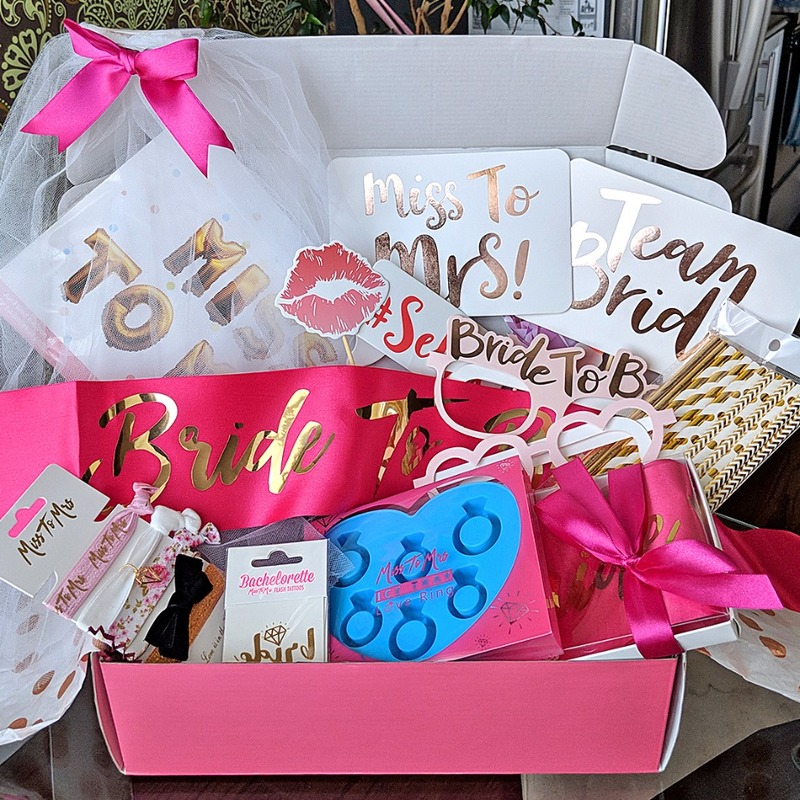 💍 Every month, brides are mailed a theme-based box filled with curated must-have wedding products: some are designed to help you plan and prepare for the big day, others are designed to spoil and pamper you with all kinds of fun bridal swag! 💍 You can choose from a variety of subscription plans - month-to-month, 3, 6 or 8-month options; of course, the more boxes you commit to, the more $$$ you save! 💍 Nearly all of the items packed in the MTM box are unique to MTM, exclusively, so you can be sure you’re getting the highest-quality items and the best bang for your buck, all the time. One of the reasons why the Miss to Mrs Box is much better than the rest, is the fact that each box comes with 6-8 items, plus promo samples & tips cards. Competitors, on average, send about 4-6 things, so you’re getting a lot more exciting stuff. The tip cards are great, too; one of my sister’s boxes came with a card full of bridal shower ideas, games, etc. which was SO helpful when we were strategizing her shower. Each box is bursting with so much that, truthfully, you can share with some of your friends. But who actually wants to do that?!?! Doesn’t being a bride mean that your ⛈️ never has to shared or stolen? 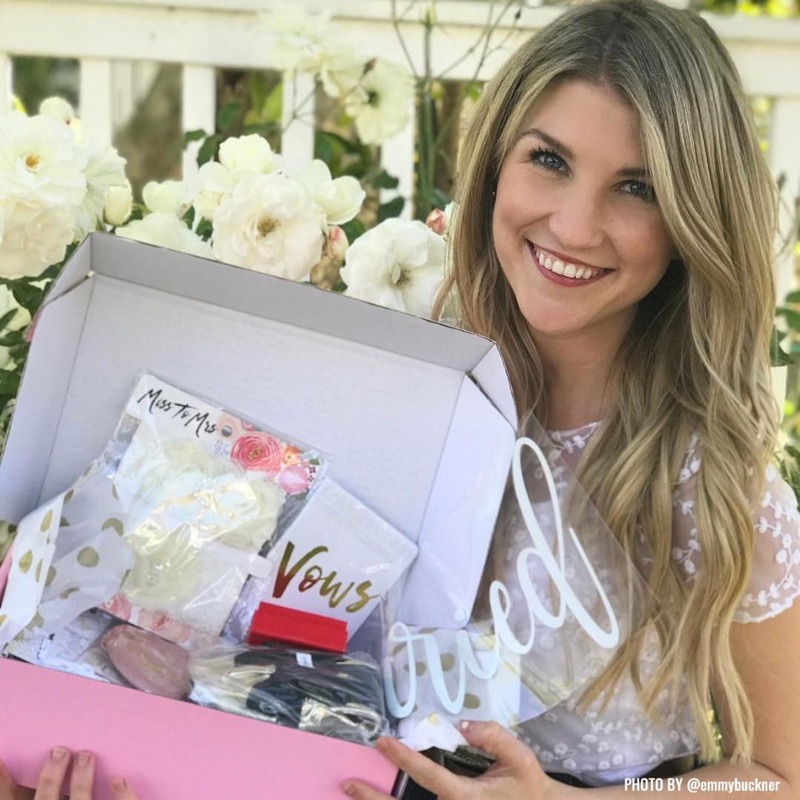 Yes, lots of bridal subscription boxes have that ‘tailored’ touch to them, be it using the bride’s new last name on a tee-shirt or tumbler, or sending all wearable things in her size + her size only. 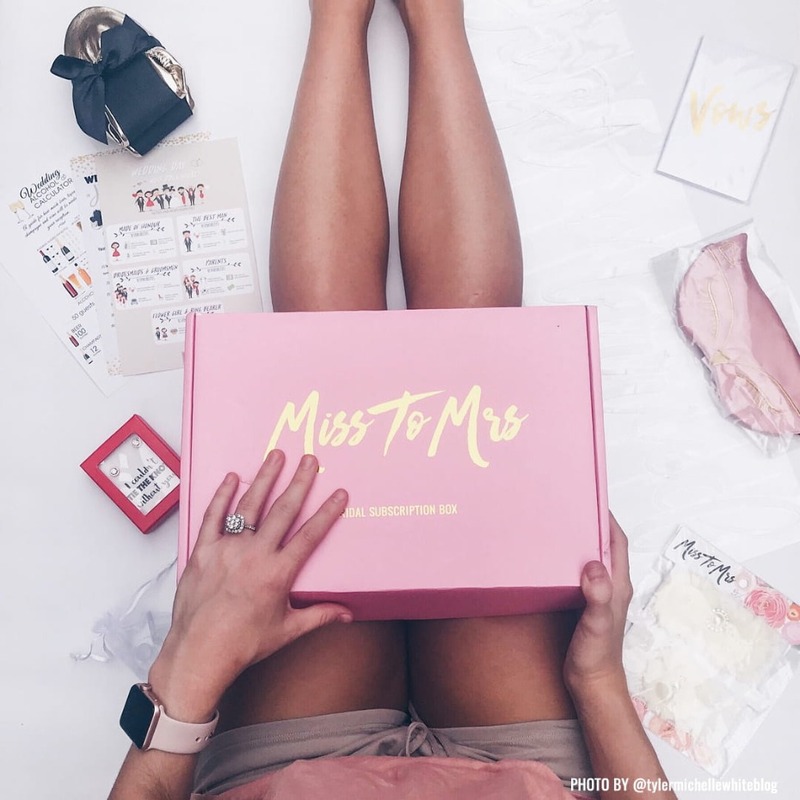 But what we love about the Miss to Mrs Box is that instead of all subscribers getting the same box each month, they get a curated themed box that coincides with where they are in their wedding planning process, whether that’s the thick of planning - when relaxation is paramount - or lead up to her bridal shower or bachelorette. It’s personal. From a “Let’s Plan This!” box full of new-to-the-bride-game necessities like adorable diamond-topped pens (I haven’t been engaged in YEARS, but I try to find any opportunity to use my sister’s diamond pens, I’m obsessed), novelty tying-the-knot paper clips, a ring dish to hold your brand new piece of [expensive] jewelry, and more, to a “Honeymooners” box full of all the things newlyweds need to jet set to faraway places. A floral-printed passport holder and luggage tags map out a great way to start your ‘wheels up’ adventure! You know that When Harry Met Sally quote, “when you realize you want to spend the rest of your life with somebody, you want the rest of your life to start as soon as possible?” Kind of applies to the bridal box situation. Once you decide on the one that you can’t live without, you want to live with it ASAP, and Miss to Mrs Box can make that happen. They have a dedicated customer service team that works seven days a week - and once you subscribe, your first box ships within seven days of purchase. 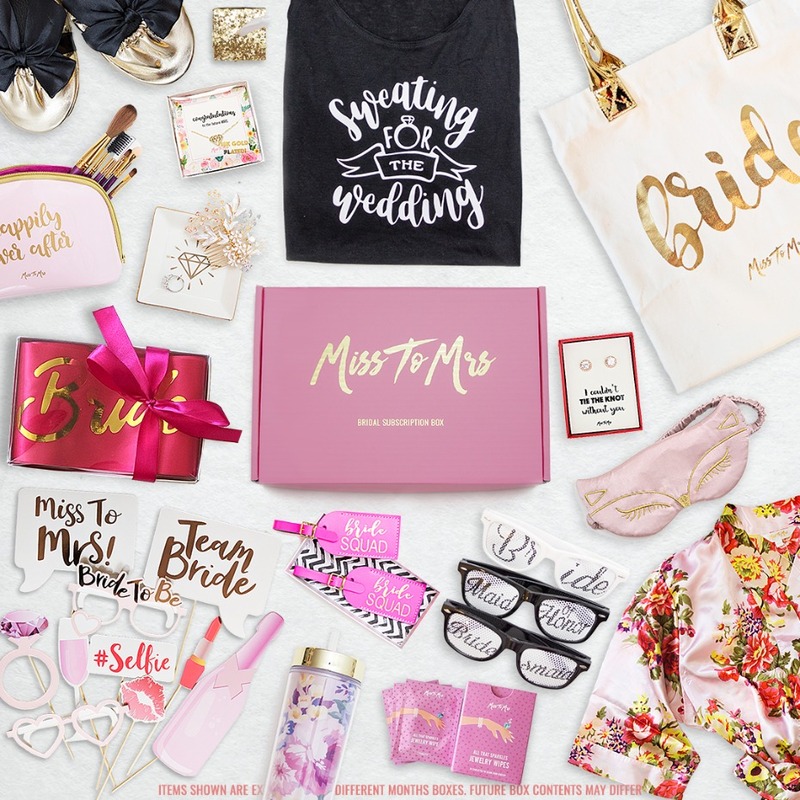 We partnered with Miss to Mrs Box to unbox all of the deets on this sublime subscription box for brides. As always, thank you for supporting our sponsors!